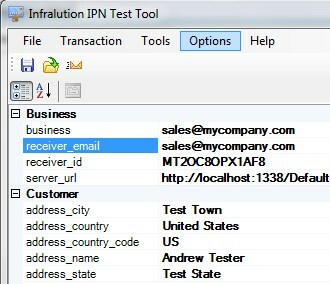 Infralution IPN.NET provides a complete ASP.NET solution for automating your purchasing and product licensing system using PayPal's Instant Payment Notification (IPN) mechanism or other ecommerce platforms. IPN.NET is used in conjunction with the Infralution Licensing System to provide a complete licensing and purchasing solution. IPN.NET includes a sophisticated IPN Test Tool (see below) that allows you to fully test and debug your IPN Server on your local development machine. You can download a fully functional evaluation version of IPN.NET to fully test and evaluate your complete purchasing system before making the decision to purchase IPN.NET. Customers click on PayPal purchase buttons on your purchase web page to add items to their shopping cart. When they have completed shopping they make their purchase using PayPal's payment facilities. Customers can pay by credit cart, echeck or from their PayPal account. They do not have to sign up for a PayPal account to use PayPal's payment mechanism. Once PayPal has received and verified the payment they post details of the transaction to the web address (on your website) where you installed IPN.NET Server. IPN.NET Server verifies that the posted data is a legitimate PayPal transaction and that the payment is correct for the purchased products. It then generates license keys (if required) and emails the customer with customised information for their purchase. The customer, sale and license key data can be recorded directly into the Infralution License Tracker database. Alternatively if the IPN.NET web service is hosted remotely the data can be recorded into a standalone database and then imported into the License Tracker database later. An email with an XML attachment containing full details of the transaction is also sent a nominated notification email account. Integration with other ecommerce and web integration platforms (such as Zapier) is supported via a secure JSON Web interface that allows authenticated clients to generate license keys and email customers automatically. PayPal's payment processing fees are lower than any other distribution and payment mechanism. PayPal currently charges 2.9% + 30c on each transaction. This is 5 to 10% less than the lowest cost third party software vendor. Even better, there are no nasty wire transfer fees since PayPal allows you to transfer funds directly to your bank account at no cost. If you sell $1500 worth of product a month then you will save the cost of IPN.NET in the first month. A secure JSON Web API allows authenticated 3rd party ecommerce sites and integration platforms (such as Zapier) to generate license keys and email customers. A predefined Zapier app allows integration with other Zapier apps with little or no programming. A product can be tagged as an update allowing you to verify eligibility for the update before the customer is sent the product. The expiry date of authenticated licenses purchased using a subscription is automatically updated when the subscription is renewed. Allows you to prevent customers, with email addresses from anonymous email providers (eg hotmail), receiving product emails until you have verified their details. Credit card fraudsters commonly use anonymous email address to avoid tracing. Comprehensive error handling mechanism emails full details of any errors to a nominated address so that that you are notified immediately of any issues.